A legal disclaimer is used in almost every aspect of business to help protect individuals and business owners. A disclaimer is principally a statement intended to limit the choice of rights and responsibilities that may be exercised and required by parties in a legal relationship or to simply to disclaim responsibility or affiliation. Furthermore, certain disclaimers are characterized by a voluntary waiver of an individual or business owner's rights to a disclaimant. 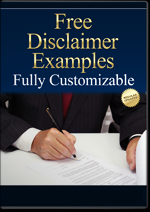 A disclaimer is generally drafted by an attorney to satisfy a responsibility to prevent unreasonable risk of harm. In general, it usually involves situations that contain some level of risk or uncertainty. And in some circumstances are used to limit an entity’s exposure to damages after an injury or some type of harm has occurred. Websites can have multiple concerns from a liability standpoint in contrast to brick and mortar businesses. Not only do many of them sell traditional products and services, but some provide their website visitors and members with a “referral service” to other companies who they recommend or endorse. By doing so, they can open themselves up to potential legal claims and lawsuits. Should someone they refer to one of the recommended businesses lose money, get hurt or incur other damages; that individual can pursue legal action or a lawsuit against the owner. Even comments, testimonials and reviews that are made on a website or blog can be subject to negligent claims. See the Federal Trade Commission (FTC) regulations covering these subjects. The FTC also has regulations and requirements relating to disclosures if you are promoting an affiliate program.